NIVEA MEN Cool 3-in-1 Body Wash gently cleanses body, hair and face without drying the skin. The long-lasting scent provides 24 hours of freshness. Play it cool and feel refreshed after the shower with NIVEA MEN Cool 3-in-1 Body Wash. You get a body, hair and face wash – all in one product. The formula with Icy Menthol provides 24 hours of freshness, does not dry out the skin and is specifically formulated for men. just awesome. Nivea Mens Cool 3-in-1 Body wash was a simply amazing Ive already bought more! My husband loves this product!. My husband was very impressed with the Nivea Men Cool 3-in-1 body wash! He is normally pretty skeptical about 3-in-1 products because he doesn't think they are usually suitable for everything they say they are. (might work for one thing but not another) That wasn't the case with the Nivea 3-in-1! It worked fantastically as a body wash. It lathered up well, cleaned his skin, and left behind a very masculine (yet not overpowering) scent. He was surprised how well it cleaned his hair, too!! His hair was so soft, light and clean after using it; no unwanted residue or coating feeling left behind like many other products tend to do. (some are just way too heavy to use in hair) He said that you could really use this to shave with, too, if you wanted to! Overall, he thought it was a very high quality product and one he would like to use again. Amazing. I received a free sample of Nivea Men cool 3 in 1 body wash from Pinchme to try. My opinions are 100% my on. My hubby liked this body wash. He had terribly dry skin and this helped moisturize him. It smells wonderful also. Smells good. So I gave this to my boyfriend and he actually likes it. It's pretty particular with his body wash so for him to approve of it, it has to be great. Manly!. Love Nivea Men Cool 3-in-1 Body Wash on my man! Great menthol fragrance and it really helps soothe away the aches after a rough day. Nivea men. I would highly recommend Nivea men's cool 3 in 1 body wash. Great scent. I enjoy the cooling sensation. It's super convenient to be able to use one wash on both my hair and body. The product lathers well and leaves skin and hair clean, it's not over drying and no residue left. Smells nice. The Cool 3-in-1 Body Wash by Nivea Men was a nice change in the shower from what we typically use. It smelt nice, it wasn't over powering or original in scent at that but a nice change and worked well. NIVEA MEN Cool 3-in-1 Body Wash. NIVEA MEN Cool 3-in-1 Body Wash has made my husbands skin feel rich and moisturized. He loved how thick and full body it feels. The smell is light and easy to handle. It isn't so strong that it covers all of his senses, but it does leave him feeling fresh and clean. My Husband loves it!. He said it is really good, the scent is nice and it isgood that is one in 3 ! Great product. My husband loved Nivea Men Cool 3-in - 1 Body Wash. It was very cleansing but not harsh. The scent was not strong and overpowering. We have allergies and it didn't bother us. Really love this product. Smells good. It feels nice on the skin and smells good. I will repurchase. Very moisturizing. The product is very moisturizing. I do enjoy the creaminess. The scent however is not appealing to me. very smelly. The smell on this is so overwhelming. I don't know any man that wants to be that fragrant! Smells great and leaves skin so soft!. 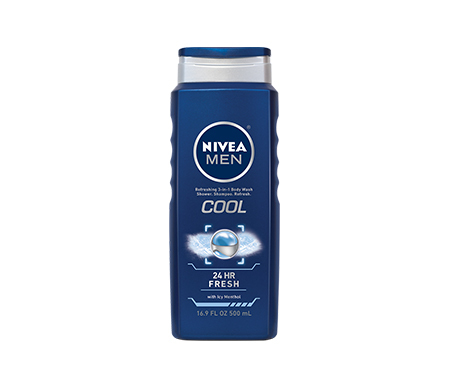 The Nivea Men Cool 3-in-1 Body Wash not only smells great but it feels great going on. It leaves my husbands skin smelling clean and moisturized. Leaves very little residue and feels great. Wonderful. My husband said he loves how this soap doesn't make him feel slimy after like some others have and it doesn't break out his sensitive skin, he loves the smell also! As do i! Great Scent, Smooth Skin. I received a free sample of Nivea Men Cool 3-in-1 Body Wash from PinchMe.com. The Nivea body wash was a huge success with my husband. He loved the scent and the thick lather. He normally gets some really bad dry spots on his back during the winter months and the Nivea body wash definitely helped to prevent his itchy winter skin. Didn't Like the Smell. NIVEA MEN's Cool 3-in-1 Body Wash was nice for the cooling effect but it smelled cheap, which I think is a really important factor. My hubby can't get enough. My husband received the NIVEA MEN Cool 3-in-1 Body Wash as a sample. He absolutely loved it! Kept talking about the scent, the consistency and the overall way it made his skin feel. After the sample was done, he couldn't wait to go purchase this product. Highly recommend this for the special man in your life. Cleans up nice. I tried the Nivea men cool 3-in-1 body wash and enjoyed it. It has a fresh, clean scent and left my skin feeling soft and healthy. Smells like a true man scent. The Nivea Men cool 3 in 1 body wash smell very manly. It cleaned from my head to toe very well. Also scent lingers well after showering. Awesome smell and product!. The NIVEA MEN Cool 3-in-1 Body Wash had an awesome smell that lasts for a long time. The product's formula was also moisturizing in a non-greasy way. He smells GREAT. My man typical likes bar soap, but I convinced him to try this. He loves it! It's a all purpose, so he's in and out, smells good, and no dry skin. Great wash. Moves men 3 in 1 body wash is a great soap and moisturizer in 1. Smells and works great.